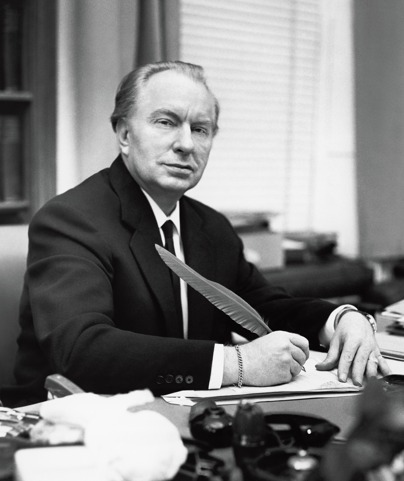 Encapsulating the humanitarian crusade of Scientologists—and, really, the cause of anyone who speaks out against a “blind system in the hands of a power elite careless of all destinies but their own,” this writing by L. Ron Hubbard illustrates that the need for good ideas to wage against bad systems is timeless. When things are not running right, when the public, unable to perceive why, drift down to an apathy below perception, when a culture, already misguided, drifts further and further toward ruin, the nation is fortunate indeed that it has men with the genius to recognize approaching doom and the courage to speak out. Fought, discredited, reviled by a blind system in the hands of a power elite careless of all destinies but their own short span, contemporary philosophers are called “Revolutionaries,” “Communists,” “Agitators,” “Malcontents,” “Rabble-Rousers” and any other harsh word which the captive press and the arrogant, pompous and blind Establishment can find in their dictionaries. Heedless, deaf to all reason, psychotic in their righteousness, the “pillars of society,” the “safe men,” like the treacherous rams of the stockyard who lead the sheep to the slaughter pens, refuse to hear any faintest criticism of their senselessness and fight back with an underhanded ferocity that seeks by any discrediting means to still any and all new thought. Yet a nation should be warned. When times decay and the death march for the system can be heard still faintly but growing stronger, there are strong voices in the land. The System, the Establishment, the Government, call it what you will, is a thing which has collected to itself all the self-seeking righteousness of decades. It is an accumulation of yesterdays and the heir to all the errors and opportunistic solutions and mistakes of another age. Men have been born into it to carry forward unthinkingly the “tradition” (and privileges) of its leadership. Men die out of it, hallowed names on tombstones and city street signs, whose fame was not remarkable for anything but stupid, obstinate devotion to government of the many, by the few and for the profit of the clique. The possessions and resources of the state, in a party-regulated “democracy,” become a prize won by an election victor at stated intervals. Political victory is an opportunity to enjoy the spoils for a stated time. The system is a whore whose favors are won by “popular election” by some new incumbent. But somehow each winner is just a member of the same machine. So long as it is profitable to the power elite, who cares what consequences are accumulated? The “next regime” can handle those. It suffices only that the system is perpetuated and that the holders of offices of the moment can ensure favors to themselves and to their friends. Whether one has a monarchy or an aristocracy, an oligarchy, a republic or a military dictatorship, the pattern becomes the same. A system is established by chicanery or false promises or force, usually in the face of danger to the state from real or imaginary external threat. It develops into a form. It hardens. It ceases to serve. It temporizes. It ceases to listen to any voice but its own and believes only that which serves the short-term profit of its leaders and their friends. It tyrannizes. It begins to die under the weight of opportunistic decisions and senseless crimes. And at some time during its course, strong voices begin to be heard in protest and in exposure. But the power elite listens only to the dead words of approved writers safely and anciently dead, from whom excuses and “reasons” can be culled to make the system’s actions seem right. And having refused to listen to the voices of today, labeling every suggestion or question or challenge or idea for change as “subversive,” “misguided,” “harebrained,” “enemy-inspired,” we eventually hear the requiem of the old boys. And the wheel has turned its long, long revolution and new faces are seen on the political signboards and new words are heard in the official bulletins of the day. If a system could hear, if there were somebody to talk to, if it cared, if the men in charge did not become so devoted to their own interests to the callous exclusion of the sufferings of all others, one might achieve political evolution to saner plateaus rather than revolution. Today we are well progressed on the cycle. The Establishment pays little heed to the times, is blind to the consequences of error, is heedless in its blindness and the men in charge, at least to the great masses of the public, look more like the madmen in charge than leaders of the public destiny. But there is still time. If those with influence and authority would listen, something could be done before it is too late. For there are voices in the land, voices of wisdom, voices indicating a way to go that leads elsewhere than to the long, long common grave where old regimes are buried, usually without the dignity of any tombstone other than a blot in the next generation’s history book.